For every homeowner who loves the way a natural stone countertop looks but hates high maintenance, quartz is the perfect alternative. Engineered quartz slabs are manufactured from real mined quartz minerals thus providing an upscale design power without having to spend too much time on sealing and cleaning their surface. Enhanced quartz countertops come with the beautiful and smooth surface of the authentic natural stone with plenty of benefits and features that marble or granite countertops cannot offer. These benefits are the main reasons why quartz countertops are likely to earn some higher ratings when it comes to sustainable building, food safety, durability and even interior design. Quartz countertops come with an enhanced engineering alternative as the high-tech manufactured process is used to provide a greater uniformity for this natural stone. Also, this engineering alternative provides a much greater flexibility when it comes to color, shape, size and all sorts of details when compared to marble or natural granite countertops. For instance, a finished quartz countertop comes with 93% quartz minerals mixed with epoxies and pigments. The result of this process is one of the most durable and hardest minerals on the planet and it is also dressed in designer colors and made stronger than ever. Quartz countertops come with patterns and colors alternatives and this is possible just in the case of engineered quartz that cannot be found in nature. Engineered quartz countertops are manufactured to harmonize with any kitchen décor. For instance, dozen of earth tones, fashion shades and rich and vivid colors are offered by several engineered quartz brands such as CaesarStone, Silestone and Cambria. 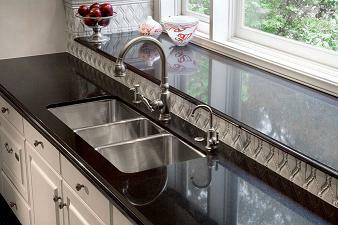 With their wide variety of edging shapes and colors, you can personalize each of your kitchen work surfaces. While not being as glossy as marble or granite, engineered quartz countertops can provide more sparkle and elegance if you add multicolored glass or mirrors. For instance, you can go for accent tiles or backsplashes that can match your engineered quartz countertop. Effectiveness is another alternative provided by engineered quartz countertops  for instance, such countertops make a durable and smooth work surface without all the breakage associated with other natural cut stones and they also discourage bacterial growth. Engineered quartz countertops are designed to take the everyday impacts and heavy use and still look great and without any scratches.